The Jacksonville Fire and Rescue department responded to the Jacksonville Fair Saturday afternoon after multiple people were injured on a ride. 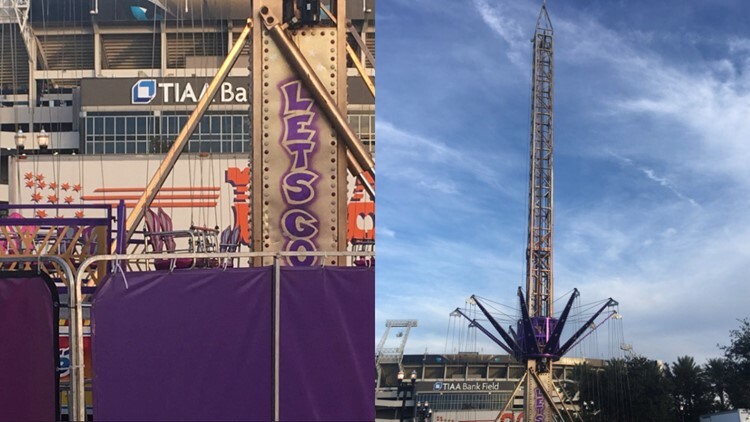 Jacksonville Fair Vice President of Marketing Gayle Hart spoke to the media Saturday to address the ride malfunction that injured multiple riders. Hart said about 20 people were on the 'Sky Flyer' when it malfunctioned around 4:05 p.m.
She said she is not sure how many people were injured, but said no one was severely injured. JFRD said multiple people suffered "minor" injuries. It is the first ride at the Jacksonville Fair to malfunction this year, Hart said. She added that malfunctions are "very rare" and says their inspectors are the best in the state. The ride will be closed during investigation. First Coast News has crews is at the scene gathering more information.